The Trophy Room is one of the most popular attractions for all hockey fans. 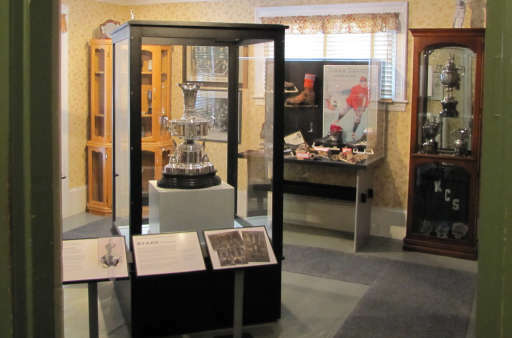 The Windsor Hockey Heritage Centre is fortunate to possess the Starr Trophy – one of the first of its kind and a predecessor to the Stanley Cup. We are now privileged to serve as host and home to both of the original Windsor Citizen’s Trophies from 1900 and 1903. The history of the trophies contained in the Hockey Heritage Center often involve interesting stories. The museum is fortunate to have the skilled and experienced resources of Carol Peterson and Kris Flynn.They will guide you while providing the details and background information that accompany each of the artifacts contained in the Windsor Hockey Heritage Museum. A brief silent film video slide show of the history surrounding the Citizen’s Cup and the origin of the Birthplace of Hockey in the town of Windsor Nova Scotia.